Coach Shin Tae-yong’s choice to add Lee Seung-woo to the national team’s roster is paying off. Lee Seung-woo’s prowess on the field has made him a must-watch player by other teams. In particular, Mexican media outlets have expressed their vigilance for the next match by describing the “Korean Messi” as the jewel of Korea. 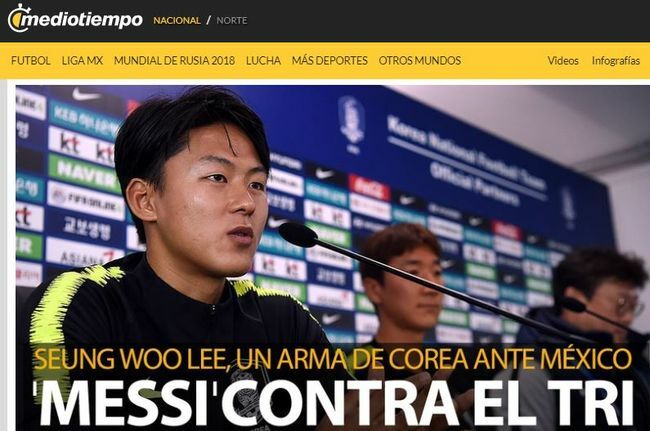 Additionally, phrases like “Seung Woo Lee, a weapon of Korea against Mexico” and references to Lee’s role as one of the primary players during his time in Barcelona’s youth team were also made. Comments like the ones above come before the two teams battle it out on the field on June 23 at 8 am PST for the Group F match. However, many see the game as an uphill battle for Korea taking into consideration the outcome of their earlier games. Korea lost 0-1 to Sweden, which it needed to win. On the other hand, Mexico beat the defending champions Germany 1-0. However, Lee’s skill on the field and his wild card factor that led coach Shin to include him in the final line-up are proving to be significant. On May 14, Shin first included Lee in a preliminary roster of players for the World Cup to the surprise of many. Explaining why he chose Lee, Shin said that it was based on a “possibility of development” and that his speed would prove to be a secret weapon for Korea.